Cash Back Apps: what are they? Cash Back apps: What are they and how do they work? ~ They are a method of savings in addition to using coupons. ~ Each app updates their offers that give you a cash back value on various products. ~ When you are planning your shopping, these are another avenue of savings to consider. 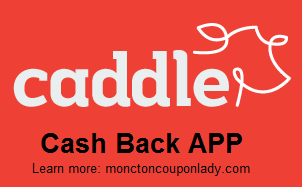 ~ You must take a photo within the app or scan your receipt to submit for the cash back on purchases. ~ Always read the fine print as some special offers are one time only, while others may allow multiple claims per item. ~ The offers can be redeemed on purchases at any Canadian Store (unless noted on the individual offer, click on them to be sure). This means a local market or Costco....places that do not honor traditional coupons, you CAN use to get these cash back offers! Here are some we have in Canada. Click on each link to see the details on how it works and what platforms it is available for. Check for new offers here weekly! Available only for iPhone and Desktop/Laptop. Available only for iPhone and Android users. ZWEET is closing shop…another cash back app gone!